Critically acclaimed folk, blues and Americana band Two Dollar Bash return on 23 April with their fourth album New Adventures on Berlin’s Cannery Row label. Comprising three equally talented musicians and songwriters from Scotland and France (plus a full supporting cast), they bring together a wealth of diverse influences and disciplines across fourteen original songs to complete their most fully realised album yet. It might prove a task and a half getting them all in the same room together, but when they do, they create beautiful sounds. The three members, Mark Mulholland, Matt de Harp and Joe Armstrong, have been playing together in different combinations throughout Europe for the past fifteen years, in a variety of bands including punk, rock, psychedelic and swing as well as the folkier formations, and also simply travelling around, picking up gigs and busking, swapping songs and stories with other musicians along the way. As well as honing their own songwriting and playing skills, this means that the band's repertoire includes many songs from friends, who in turn are singing Two Dollar Bash songs throughout Europe and North America. Since the formation of this incarnation of the band in 2003, Two Dollar Bash have been touring constantly throughout Europe, and have also completed four very successful tours of America. 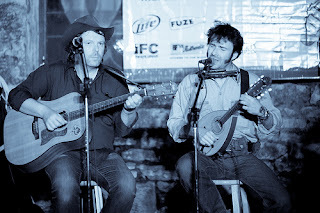 In March 2009 Two Dollar Bash were invited to perform a showcase at the prestigious SXSW festival in Austin, Texas, for a remarkable third successive year. Mark Mulholland issued his second solo album, The Cactus And The Dragon, in January to widespread approval. THE RETURN OF MYSTERY JUICE!